After my crushing defeat to Ben I have serious reservations about my 1700pt list. In fairness this was it's absolute worst performance and Ben's Orks are the most difficult Orks I've ever faced, but we all know there are other armies out their meaner and dirtier than what Ben brings to the table. So if I can be wiped out by the Orks what hopes have I against a nastier list? These were from an old ebay auction, where I picked up a load of Hormagaunts that I was going to kitbash into Termagants. They're all going to have Adrenal glands on their backs so they can join the other 20 Adrenal gaunts so I have two distinct groups of 30. Of course I have just this second realised the plan was not to have two Tervigon tax broods but I've started it now and they always needed doing. Having chopped off the SyTals the Fleshborers were a little fussy to glue back in place with out their ball and socket joint, hence why they're upside down as it helped them to gluee in a better position. What's also unclear is that there aren't 10, erm there are 13... I had 8 Hormagaunts, one of which was headless so I used a Genestealer head and I also had 5 normal Termagants so why not do the lot? The excitement for this is much like the decision to advance Old One Eye to the top of the queue for the last Blog Wars, only not to use him. But with a deadline, and now something to complete by it it's definitely a Catalyst for sustained effort and progress [there goes any chance of an early night!]. 4 weeks is quite a stretch for me I think to get all these done. 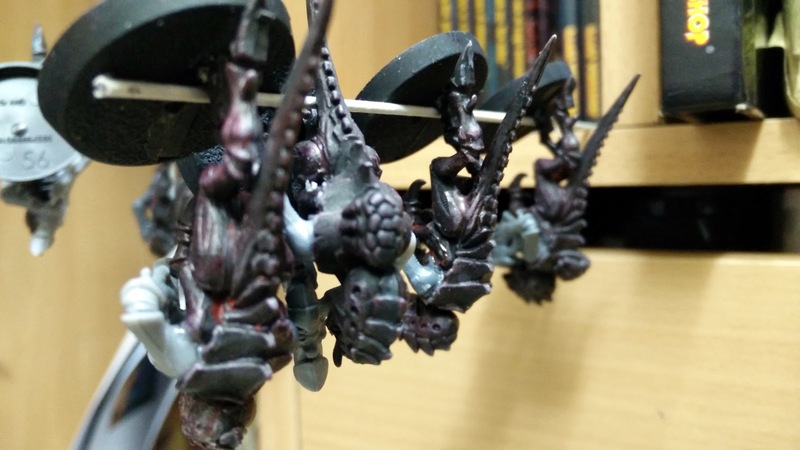 To speed up the process I've got the Army Painter Skeleton Bone Primer and will be prepping the Deathwing Knights simultaneously to at least keep progressing something Dark Angel. So, should you feel inclined here is the list [which seems quite small now I look at it] of all my nids. If you can think of a better army list at 1700pts. I definitely want at least one Fortification in because it's a showcase but if you can find anything slightly more competitive I'm open to ideas. Dave just before I gave up on 40K I try to see if going back to my competitive days could save me, if anything it hastened my depature. Anyway back to you, at that stage I ran what I felt was maybe as good a list as you can get with nids, but like all good 40K list your looking at spam mat. Now it was an 1850pts list built around 3 flyrants & 3 mawloc's, deep striking ripers gargoyles & a lictor, if you'd like to know more on it just let me know in the reply. Thanks Frank, currently with only one Trygon as a Mawloc proxy I can't really do that list. I understand you need at least two for it to begin to pay dividends. I only ever really take him as a bullet magnet and to be furstrating for my opponent although more often than not he's more frustrating to me! Still, things to think about from what you've said. The hormagaunts can take the aegis for a better save and skyfire, a venomthrope can sit with them as well for a better cover save if needed. Adrenal glands gets the two carnifex up close and personal asap pumping out dakka, flyrant does the same. Mawloc is also fast. Tervigon is now an obsec monstrous creature with a 30 brood bubble wrap advanced up the field. Crushing claws putting paid to anything. The genestealers are forward flanking distractions, ultimately expendable but will put out damage especially with the brood lord. Also plenty of warp charges here. Not perfect at all, but fairly quickly out together and is a fast moving force with plenty of dakka, a couple of answers to flyers with the flyrant and aegis as well as pure volume in dakka-fex in a pinch. Interesting Rob, not a million miles from what I already run, food for thought at least. My name is Monkeychuka and I haven't played Tyranids for 10 months 3 days 7 hours and 16 minutes. I'd love to say that it has improved my life and saved me money but I just spent it on different models/gaming systems. Fake it till you make it. You are a nutter ;) this definitely helps, ha, ha! This gives me a semi competitive list without going for the five flyrants option. The mawlocs are stars when they hit. The flyrsnts are brilliant anyway. Tervigons are a bit rubbish now. They got hit four times with the Nerf bat. From my list you would drop the dima and pod, taking the list to 1575. And in the skyshield and maybe a lictor or biovore and should hit around 1700. For a semi competitive yet fun list. Interesting, again not a million miles away from what I run aside from the extra Mawloc and Dima. Lots to think about going forward, cheers for your help. Hang on... Did you say "Imperial Strongpoint" and "scratch built" in the same sentence? And I have the Tyranid Bastion, Skyshield and Aegis, kind of lucky really they ended up with a formaiton where I could take them all!